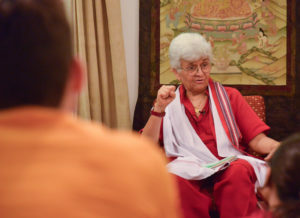 Our interview with Kamla Bhasin was on the same day that we were to leave India. None of us knew exactly what to expect, in part because this was the first time that a group from our school had met with her. That being said, I think that even with this little knowledge, any sort of expectation that I had was blown away by the content and personal approach that she took when answering our questions and conversing with us. All of her answers were well crafted and thoughtful, additionally, on top of her concise use of language she often brought up information that was completely new to me. This made the interview unique. Although each of our previous interviews introduced new information and plenty of learning opportunities, I found that many of the things that resonated with me would be things that I already knew, but were restated in a better way, or connected to another principle. In this interview, the things that seemed to strike me the most were completely new principles. For example, this interview was the first time that I was introduced to the principle of Capitalist Patriarchy. This is the idea that capitalism today helps patriarchal principles expand further into the world through capitalism. I had never heard of this idea directly spoken about. She included an explanation that connected in a relevant way to my life. Referencing things like cosmetics, entertainment, and fashion industries as perpetrators of this patriarchal expansion, I could really see how the patriarchy is continually allowed to thrive and grow in today’s world. I also saw how we are aiding it by purchasing and buying into certain industries. 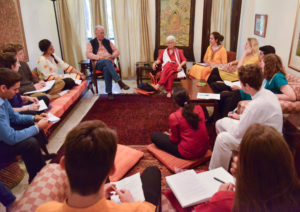 In our last day in Delhi, we had the amazing opportunity to interview Kamla Bhasin. As was the case with a lot of the situations we have been put in on this trip, it was nothing like I expected. It was a unique experience from beginning to end, starting with the fact that we were in her house, and ending with incredibly emotional experience that had some of us in tears. 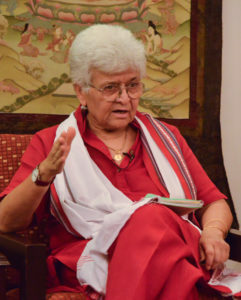 Through a combination of new information and Kamla Bhasin’s open and hospitable attitude, I feel like she will always be a person I will remember, and admire. I didn’t know much about her before the interview, but afterwards she has become an inspiration for me. Hearing what she had gone through in her family life and the challenges she had to overcome emphasized the resilience, strength, and intelligence she possesses. She could have given up, but instead, she continues to make meaningful change in the world, regardless of the obstacles she faces in her work, or in her personal life. What struck me the most about Kamla was her beautiful and energetic personality. When she told stories, she would use her hands to gesture playfully, and she would change voice pitches to represent the other people in the story. Most importantly, she was able to be completely open up to us; she modeled vulnerability. Kamla shared with us how her son, now in his thirties, had been given a vaccination before he was a year old, and how it caused him to be entirely unable to take care of himself. No one believed that it was the vaccine that caused the problem, and yet Kamla has remained strong. She then explained the heartbreaking story of how her daughter committed suicide while in the process of getting her PhD in history from Oxford. I truly admired her openness with us, and it amazes me how she has found light at the end of these terrible hardships in her life. I am blown away. At the end of the interview, we sang “One Day” without the guitar, which made it feel even more raw and in the moment. The moment she took off her glasses to wipe away tears, I looked around our group to see many of us, including myself, tearing up. 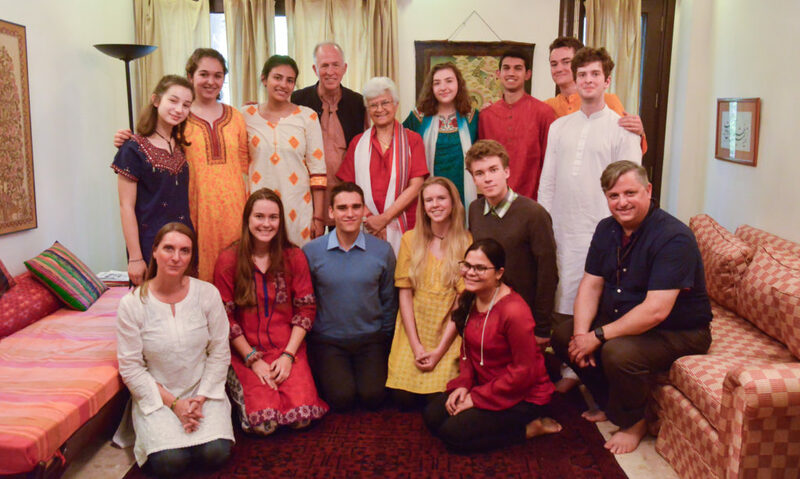 Sharing such a vulnerable and loving experience with Kamla is something I’ll never forget. I think it shows the importance of expressing our emotions and allowing ourselves to become vulnerable in order to connect with others in a valuable way.